Lake Erie algae alive and well. A bloom of toxic algae is seen around the southern end of Pelee Island, Ontario, on September 4, 2009.Click image to enlarge. Nearly a month after a bloom of toxin-producing algae made the water undrinkable for more than 400,000 people in Toledo, Ohio, the noxious green slime is still fouling Lake Erie’s water. This week, the bloom thickened up around Pelee Island, Ontario, and prompted the local health board to advise residents not to use their well water. The island’s population fluctuates between 300 permanent residents and 1,500 summer residents, and most homes receive water from wells near Lake Erie. Some of the wells showed levels of microcystin– an algae toxin that can cause nausea, vomiting and liver damage when ingested –above the safe drinking water threshold. The municipal drinking water plant for the island did not detect the toxin in its treated water. Residents and visitors to the island don’t seem too worried about the algae, which has also led to beach advisories, according to reports from the Toledo Blade. Water managers in nearby Ontario communities also appear unconcerned, and are confident they can treat the algae as they have in past years, the Windsor Star reported. NOAA forecast of toxic algae bloom in Lake Erie’s western basin, August 27, 2014.Click image to enlarge. Meanwhile, it looks like the bloom will be sticking around for the foreseeable future. 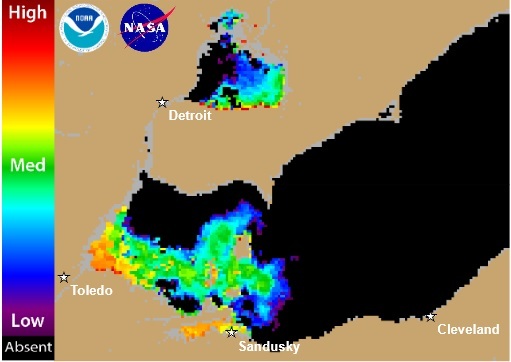 The algae continue to expand in Lake Erie’s western basin and are moving toward Sandusky, Ohio, according to the latest forecast released Wednesday by the National Oceanic and Atmospheric Administration (NOAA). “Northeast winds today and tomorrow will continue to transport the bloom Southeast towards Sandusky, and become more concentrated towards Kellys and South Bass Islands,” the forecast said. You can sign up to receive NOAA’s algae forecasts here. 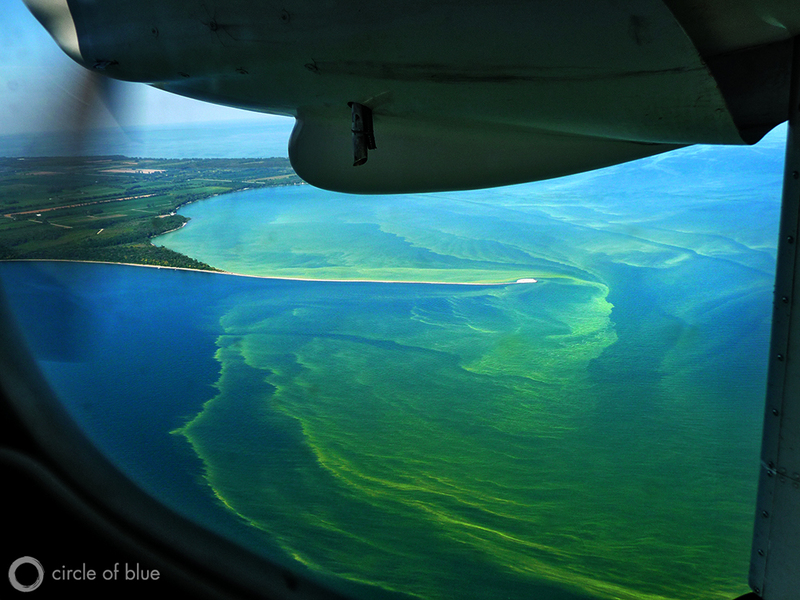 Read Circle of Blue’s most recent coverage of the algae blooms here.